What Are The Prospects For A Labor-Green Senate Majority? I've had a few questions recently about the chances of a Labor-Green Senate majority after the 2019 federal election. This is on the assumption that, as is currently looking likely, Labor wins government in the House of Reps and does so by at least a modest margin. 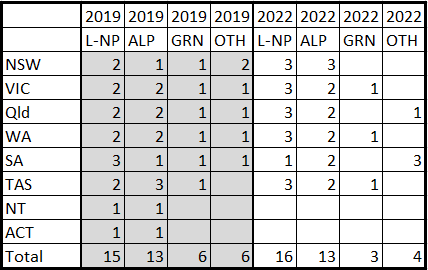 My view at the moment is that while it is likely Labor and the Greens will make some combined seat gain in this situation, it is unlikely that they will manage a combined Senate majority. My modelling on which this conclusion is based is below - a warning that it gets very technical in parts, most parts in fact; this article has been rated Wonk Factor 4/5. This week's news that Cathy McGowan is stepping down from the seat of Indi at the 2019 election after two terms makes this seat an even more interesting contest to keep an eye on. Following a preselection process, the Voices for Indi group has endorsed nurse, midwife and rural health researcher Helen Haines to be McGowan's successor as the next "Orange Independent" for the seat. McGowan won Indi in 2013, defeating 12-year Liberal incumbent Sophie Mirabella in a seat the Coalition had held comfortably since 1931. At the 2016 election the Liberals re-endorsed Mirabella, but McGowan's two-candidate preferred vote blew out from 50.25% to 54.83%. The Liberals' re-endorsement of a contentious former MP meant that we never got to find out how much of McGowan's success was an anti-Mirabella vote and how much was a vote for a movement independent of the major parties and in reaction to major parties neglecting safe Coalition rural seats. Clearly the latter factor - once mainly a NSW thing - is growing in Victoria (as witnessed by Suzanna Sheed's wins in Shepparton and Ali Cupper's win in Mildura) but the most closely Voices for Indi backed candidates failed to wrest Ovens Valley and (narrowly) Benambra from the Coalition at the recent state election. "Labor Senator Murray Watt says Barnaby Joyce shouldn't be Acting PM. Who the hell is Murray Watt? Barnaby will be Acting PM next week. Murray should worry about acting as a real Senator. Like see actual constituents & be relevant. At the moment its Watt by name, who by nature." George Christensen kicks off this year's Ehrlich Awards for Wrong Predictions with the above piece of banter dated 15 February. In fact, Barnaby Joyce took leave for the week following the comment, and was not Acting PM, and soon after stood down as Nationals leader and Deputy PM as well. This one sets the tone for a year in which a common theme was Coalition MPs or sympathisers expecting that pretty much anything would go right for their side of politics. I'd include more left-wing failed predictions for balance, but this year I just haven't seen that many. Feel free to add more examples I have missed in comments. The first part of the year actually started similarly to 2014, with roughly similar levels of interest in the Tasmanian and South Australian state elections. However this year had the bonus features of the Super Saturday and Wentworth by-elections, and there was also more interest than in 2014 in my coverage of both the Tasmanian local government elections and the Victorian state election (the big spike on the right). Partly this was because I wasn't working on anything else at the time Victoria rolled around and was therefore able to put much more effort into analysis of the Victorian upper house especially. It's pleasing that people supported these efforts with donations - while I'm in no danger of getting rich from them, it does mean I can put major effort into covering an election and feel that the pay is something like real work!